Victoria Spivey (October 15, 1906 – October 3, 1976) was an American blues singer and songwriter. During a recording career that spanned forty years, from 1926 to the mid 1960s, she worked with Louis Armstrong, King Oliver, Clarence Williams, Luis Russell, Lonnie Johnson, and Bob Dylan. She also performed in vaudeville and clubs, sometimes with her sister, Addie "Sweet Pease" Spivey. 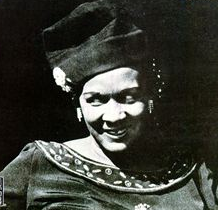 Among her compositions are "Black Snake Blues", "Dope Head Blues" and "Organ Grinder Blues". In 1962 she initiated her own recording label, Spivey Records. 1211 – Battle of the Rhyndacus: The Latin emperor Henry of Flanders defeats the Nicaean emperor Theodore I Lascaris. 1783 – The Montgolfier brothers' hot air balloon marks the first human ascent, by Jean-François Pilâtre de Rozier, (tethered balloon). 1864 – American Civil War: The Battle of Glasgow is fought, resulting in the surrender of Glasgow, Missouri, and its Union garrison, to the Confederacy. 1888 – The "From Hell" letter sent by Jack the Ripper is received by investigators. 1910 – Airship America launched from New Jersey in the first attempt to cross the Atlantic by a powered aircraft. 1917 – World War I: At Vincennes outside of Paris, Dutch dancer Mata Hari is executed by firing squad for spying for the German Empire. 1969 – Vietnam War; The Moratorium to End the War in Vietnam is held in Washington DC and across the US. Over 2 million demonstrate nationally; about 250,000 in the nation's capitol. 1970 – The domestic Soviet Aeroflot Flight 244 is hijacked and diverted to Turkey. 1971 – The start of the 2500-year celebration of Iran, celebrating the birth of Persia. 1987 – The Great Storm of 1987 hits France and England. 1997 – The first supersonic land speed record is set by Andy Green in ThrustSSC (United Kingdom), exactly 50 years and 1 day after Chuck Yeager first broke the sound barrier in the Earth's atmosphere. 2003 – The Staten Island Ferry boat Andrew J. Barberi runs into a pier at the St. George Ferry Terminal in Staten Island, killing 11 people and injuring 43. 2007 – Seventeen activists in New Zealand are arrested in the country's first post 9/11 anti-terrorism raids. 2008 – The Dow Jones Industrial Average closed down 733.08 points, or 7.87%, the second worst day in the Dow's history based on a percentage drop. 2011 – Global protests break out in 951 cities in 82 countries. 1890 – Álvaro de Campos, a heteronym of Fernando Pessoa (d. 1935). 1949 – Laurie McBain, U.S.American novelist.